I have no idea what this says in Korean, but this is a hearty loaf filled with nuts and some fruit–I can’t put my finger on what type of fruit, but whatever it is it’s good. Not too sweet, and almost substantial enough to be eaten on it’s own as a meal. Le Pain is a great bakery located in Myeongdong Cathedral. They have a big selection of bread, including some decent baguettes, garlic bread, and other various rolls and bread. There is a large selection of European-style bread with fruit or nuts in it. Bread comes out at multiple times during the day, but to be safe you may want to come around 11 am or so. They open at 10, and by 10:30 or 11 they should have all the bread you see here. Le pain is located in the Myeongdong Cathedral. This Google Maps address is correct, although it falsely calls Le Pain a “baking supply store” when it actually is just an honest-to-god bakery with bread for sale. Whole wheat bread, rye bread, seeded bread. Don’t blink–you’re not in Europe, but the bread is pretty close. Admit it, you’re buying this just because it looks cool. This onion bread looked great–then I bit into it and realized it has bacon or something inside–totally hidden from the top. Just another one of the many indignities you suffer being an illiterate vegetarian. Their fig bread is on point. Tough and only naturally sweet. Maybelle is located in Itaewon, just North of the Starbucks Reserve, and near the Saboten concept store. Gontran Cherrier is a chain bakery with great Croissants and baguettes. There is a large selection of European bread, including products using darker grains. I think that thing that looks like a black pizza is colored with squid ink. This map shows the Gontran Cherrier location in Itaewon, but they also have branches in Gangnam and Ichon. The Baker’s Table is a restaurant and cafe with soups, sandwiches, and bread that you can buy to go. It’s been years since I’ve eaten here, but I had an amazing sandwich here. That focaccia looks so good right now. There are two Baker’s Table stores. One is located at Seoul Square mall near Seoul station, and the other is north of Itaewon station. This map shows the Seoul Station location. If you want European bread, Itaewon is the place to be. Although I’ve found good bread in Myeongdong and Gangnam, the highest concentration is definitely in Itaewon. 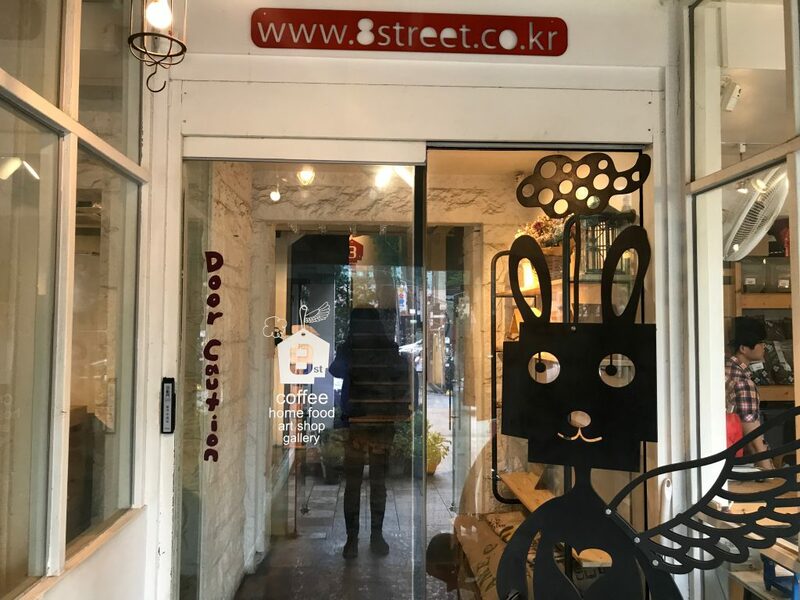 If you’re in Seoul you should check Seoul’s best vegetarian restaurants, 12 must-visit destinations in Seoul, and Unistella. Interested in starting a blog and making money as a writer? Check out Come Write With Us, the online writing course I made with Kristin Wong. We share our experience writing for clients like The New York Times, National Geographic, Lifehacker, The Financial Times Press, and more! Know any other good bakeries? Let us know in the comments!